This thread is for comments about our Beast Mastery Hunter guide. Was bestial wrath left out intentionally? Rapid Fire should be used as many times as possible during the encounter. It is not recommended to stack this cooldown with Heroism/ Bloodlust/ Time Warp. It is, however, advised to stack it with any other procs, on-use trinkets, potions, and fight mechanics that cause you to deal increased damage. You should not stack Rapid Fire with Bestial Wrath, because the increased focus regeneration granted by Rapid Fire will be useless as Bestial Wrath (thanks to The Beast Within) reduces the focus cost of all your abilities by 50%. You can see that using Bestial Wrath at the same time as Rapid Fire is a waste since you'll have increased focus regeneration AND reduced focus cost at the same time. This will probably give you more focus than you can use and you will waste focus once you're at the focus cap. Therefore not having bestial wrath in the macro will give you the highest DPS increase as long as you use the ability on cooldown, so either before the macro, or after the macro when rapid fire ran out. Thar is not right, sorry. The thing is, that the cooldown of Bestial Wrath is also reset when using Readiness so with not using Bestial Wrath before it you lose all the benefits of it. it does not matter if you get focus capped while all your cds are up, because your pet will do lots more damage with Bestial Wrath up and so will you. Also does Lynx rush profit from Bestial Wrath and Rabid (ferocity pet skill) and you might want to use those two together. Make sure that Hunter's Mark is applied to the target. Cast Rapid Fire, Lynx Rush, Dire Beast, Stampede (in any order). We recommend a macro for this step. Cast Readiness to reset the cooldowns of all your abilities (except for Stampede). As soon as the buff from Rapid Fire fades, and as soon as the pets from Dire Beast disappear, re-cast these abilities. When the second Rapid Fire wears off, cast Bestial Wrath. In this starting sequence you use readiness immediately after using the macro in which case putting Bestial Wrath in the macro is a good thing. If however at any time during the fight you were to use the same macro (while Bestial Wrath and Rapid Fire are usable), without being able to use Readiness right after it. The focus you'll lose could have been used more efficiently if you used the cooldown later on and given you a DPS increase. According to this post lynx rush does not benefit from anything. I guess Vlad or Damien tested this on dummies or in simcraft and I'm sure that one of them will answer your question with a more in-depth response or confirming my theory. Sorry for responding to this with a delay. In regards to using Bestial Wrath in the opening sequence macro, Glatzel is correct (as MadMonk pointed out). This situation is exceptional, but your logical is spot on. The guide will be updated very shortly (both the rotation page and the macros page). Regarding the second point, I don't know if you were asking or telling, but Bestial Wrath does indeed improve the damage of Lynx Rush. But this makes little difference, in practice, because Bestial Wrath has a 1-minute cooldown, and Lynx Rush has a 1.5-minute cooldown. This means that only every third use will be stacked - delaying either of them to match the other is not only not a DPS gain, but indeed a DPS loss. I agree that the wording of the Lynx Rush description could be better in this regard, and I will fix that as well to say that, when possible, you should line it up with Bestial Wrath. The first is with bestial wrath and the second is without. So I'm not here to say I'm the hunter master, but having bestial wrath macrod in my abilities seems like it would be the better choice. Now even if I am wrong (which I can accept), I will still continue to use bestial wrath in my macro since for me it seems like the best option. Edit: I guess i'll have some macro testing to do Tuesday! Testing it out on the beta brings me to the conclusion that if I apply SrS and spam arcane shot and kill command until the duration of bestial wrath ends I wont get focus capped. sorry if i was not able to express myself correctly. of course i did not want to say that one shoult pop Bestial Wreath together with Lynx rush all the time. Of course Bestial Wreath should be used on cd. But Rabid has a 1.4 minutes cd and Lynx Rush has 1.5 so that maybe it would be a dps gain if those two are bound because 6 seconds delay on Rabid don't make a big difference in dps but it pushes Lynx rush a lot. also i thougt that the macro was only supposed to be used at the beginning of fights so that, of course, infight Bestial Wreath and Rapid Fire are not used at the same time. What are your thoughts on that suggested stat priority? Have you folks over at icy-veins considered a recommended pet section? Like a worm specifically for BM as it has AOE capabilities. Seems reasonable... My pet almost matched my damage in the LFR i ran today and my crits I had was little. And since Cobra Strikes is up it makes that ~30+% crit devalue for your pet. You forgot a brand new buff from pets. Water Striders which can be tamed with patch 5.0.4 via Fen Striders in Zangamarsh[also underbog (a boss), and adds on last boss in Serpentshrine Cavern (hard tame due to fear)] and the Water Striders that are in MoP. Passive	Infuses all party and raid members within vision with still water, increasing their spell power by 10% and their critical strike chance by 5%. Coincidentally this pet also provides waterwalking via active abilities that last 10 minutes. Unlimited range	Instant	Allows the Hunter and the Water Strider to walk across water for 10 min. Any damage will cancel the effect. This is close to what we wrote in the guide, the only notable exception being that we revered Haste and Mastery. We agree that Haste should be low(est) for now. The guide will be updated shortly to reflect this. Thanks! We're going to include it. Thank you very much for reporting this. I added both these spells in the Beast Mastery Hunter guide. 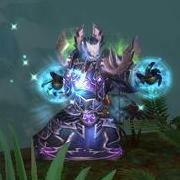 Still Water is now also mentioned on class page that has the +10% Spell Power buff or the +5% Critical Strike Chance buff. 9. As soon as the buff from Rapid Fire fades, and as soon as the pets from Dire Beast disappear, re-cast these abilities. I just tested this and noticed that it is possible to have 2 beasts at the same time so there is no need to wait for the first one to disappear, just cast the second right after using readiness. Since Rabid is on a 1.4 minute CD ( Exotic Beasts factored in the CD), wouldn't it be beneficial to turn it off of auto use and macro rabid to bestial wrath, lynx rush, etc.? i prefer to macro it to lynx rush, because the cds are nearly the same (i think there is a 6 seconds difference) and because you use it rabid every 1.5 minutes this way you automaticaly use it every 3 bestial wreaths (i also think that i mentioned this in a post before^^). Zeherah says that kill command can be used while your worm is underground while if you use it with the chimera it interrupts their aoe. And some other stuff for future reference. Do you guys even read your own guides? In this section, we assume that you have taken Dire Beast, Lynx Rush, and Glaive Toss from your tier 4, 5, and 6 talents, respectively. This is because we deem them to be best talents for your DPS." Well, you managed to be consistent with ONE Talent choice. Shame it is one that is not even available to players yet! Unless in Section 3 you are looking at DPS output, but in Section 1 you are selecting Talents not based on DPS output, but against some other unnamed criteria? In all seriousness, I started poking around on this site due to EJ being slow getting up-to-the-minute information concisely presented. What I have found here is information that looks well presented on the surface, but once probed it reveals low quality attention to detail in areas like this one. EJ may be lagging behind in getting the Class/Spec posts organised to their previous standard, but if Icy Veins is even thinking of trying to hold a candle to them as a Class/Spec resource then it needs to lift its game and not make such basic errors. Right now Icy Veins is starting to slide down in terms of trust just as happened to Noxxic. Remember when Noxxic first came out and everyone said "Oh wow, you have to use Noxxic, they are uber"? Then ppl started looking at it and it became fairly clear that if the advice on a given topic was clearly explained and on the first page of an EJ post, then the Noxxic advice magically agreed with it, but if the better advice from EJ was found buried away deep in a forum topic, then Noxxic quite frequently missed the point and gave out questionable advice. This lead to the view among serious gamers that Noxxic was good for noobs and EJ was the resource for those with the ability to comprehend the finer details. This site has a lot of potential but it is spoilt by errors such as noted above. These talents are being constantly re-balanced on the Beta, so any evaluation of their comparative worth is subject to change. At any rate, as of writing this guide, Lynx Rush provides the biggest DPS increase, and should be the default choice. This talent is particularly good because it benefits from your Mastery ( Mastery: Master of Beasts). Copied directly from the BM hunter page. Think this is more of a problem with you reading than an "omg icyveins is noobs dont follow their own advice" issue. I'm not sure where you are seeing these talent choices. If you actually read the guide you'll see that all three talents are explained in order of appearance in the talent screen. Right underneath their explanation you'll see that the pros and cons of the talents are addressed before pointing out which one you should take. All three choices are consistent in both section 1 and 3. I would suggest that next time you probe a bit deeper. Mistakes do happen, especially when all these guides are written by just two guys. But the 'mistakes' you pointed out are not among these. No. Personally I never heard about Noxxic until Damien told me they existed not too long ago. I went and checked out their website but didn't really like it. Their guides are very small, give no expanation about anything and just sum up some stat orders and talent choices without explaining their choices or alternatives. I really like EJ, they give a lot of information with a good explanation, but I don't like their format. Also, I could never get used to their website. I feel that their website is not very accessible for the average player. Thanks for your response MadMonk. I read it with interest and as result went back and re-read the IV post. Without doubt it was my misunderstanding. My incorrect assumption was that "First, Second and Third" choices implied a priority order. Having re-read the sections as result of reading your post I understand that it was my interpretation that was wrong. The talents are indeed consistent between the sections. My apologies are therefore also due to Vlad and the IV team. Thanks again for pointing out my error. Everyone makes mistakes (I make them more than anyone). I hope you like the guides and they help you out. Cast Lynx Rush, Dire Beast, Stampede, Bestial Wrath, and Rapid Fire (the order only matters insofar as Rapid Fire is used last). As soon as the buff from Rapid Fire fades, re-cast it. When the second Rapid Fire wears off, cast Bestial Wrath again. When the second Bestial Wrath wears off, cast Rapid Fire again. If you do the second method you will have rabid on still for the second Bestial Wrath and Lynx Rush. If you do the first your rabid wears off and your pet's damage diminishes. That is just my theorycrafting because either way you will be using the CDs but your biggest pet CDs will be buffed from Rabid still being on your pet. Also rapid fire will increase your focus regen seeing as how you probably dumped a lot of it during the first and second bestial wrath it'll help you regain it.